The results of the Crossrail 2 consultation have been published with opinion split on its Hackney route and concern over any possible tunnel entrance on Walthamstow Marshes being raised by several respondents. The option of the tunnels emerging north of Tottenham Hale was also raised by some. [The plans involve a] tunnel portal to the south of Tottenham Hale, although the exact location has yet to be determined. Further engineering feasibility work is being carried out to review options for the tunnel portal and the impact this would have on the area required. A 2013 engineering feasibility study had placed this portal at Copper Mill Junction on Walthamstow Marshes. 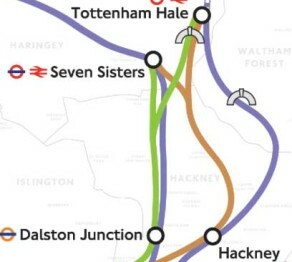 A detailed analysis of this and other possibilities is in our previous post, Crossrail 2 emerges on our doorsteps? For now, it seems no option has been ruled out – or in – and local residents and users of Walthamstow Marshes, Markfield Park and the River Lea must wait and see. You can download the full Crossrail 2 consultation 2014 report [PDF, 15.3Mb] via the TfL website. This entry was posted in Transport and tagged Crossrail 2, Markfield Park, Tottenham Hale, Transport for London, Walthamstow Marshes on October 28, 2014 by admin. The Mayor’s preferred route is via Dalston Junction which lets the Lea Marshes off the hook. The tunnel portal will most likely be in the South Tottenham railway triangle. Having said that of course, there is plenty of scope for the route to be changed in the long run up to eventual construction, if and when that happens. Thank for the info, Glenn. The portal presumably has to be to the east of South Tottenham station, and the consultation says to the south of Tottenham Hale. So you think maybe the portal could fit in the triangle northeast of Markfield Park, where the GOBLIN crosses the Ponders End line? I still can’t see how they could run 4 tracks into Tottenham Hale from there; there physically isn’t the space between Tottenham Retail Park and Jarrow Road. But it guess it saves a vast amount of money compared to developing sub-surface platforms at Tottenham Hale with tracks fully emerging to the north. Still, as you say, we shall see what plans are announced as the process moves slowly forward. As an aside, I thought it was interesting LB Haringey’s response specifically mentions Crossrail interchange with South Tottenham… And we thought the station was busy now! (It’s all good though, I remember all too well the dark days of the unmanned station with one train an hour on Sundays). Balabam Venue on Balabam South Tottenham! Maia Barouh on Balabam South Tottenham!